There is a controversy about the origin of the recent decadal Atlantic Meridional Overturning Circulation (AMOC) slowing observed at 26.5°N and concurrent sea surface temperature cooling in the central and eastern mid-latitude North Atlantic. We investigate decadal AMOC slowing events simulated in a multi-millennial preindustrial control integration of the Kiel Climate Model (KCM), providing an estimate of internal AMOC variability. Preindustrial control integrations of 15 models participating in the Coupled Model Intercomparison Project phase 5 also are investigated, as well as historical simulations with them providing estimates of AMOC variability during 1856–2005. It is shown that the recent decadal AMOC decline is still within the range of the models’ internal AMOC variability and thus could be of natural origin. In this case, the decline would represent an extreme realization of internal variability provided the climate models yield realistic levels of AMOC variability. The model results suggest that internal decadal AMOC variability is large, requiring multi-decadal observational records to detect an anthropogenic AMOC signal with high confidence. When analyzing the strongest decadal AMOC slowing events in the KCM, which have amplitudes similar to or larger than the recently observed decadal AMOC decline, the following composite picture emerges: a very strong decadal AMOC decline is preceded by a decadal rise in atmospheric surface pressure over large parts of the mid-latitude North Atlantic. The change in low-level atmospheric circulation drives reduced oceanic heat loss over and diminished upper-ocean salt content in the Labrador Sea. In response, oceanic deep convection and subsequently the AMOC and northward oceanic heat transport weaken, and anomalously cold sea surface temperatures develop in the central and eastern mid-latitude North Atlantic. 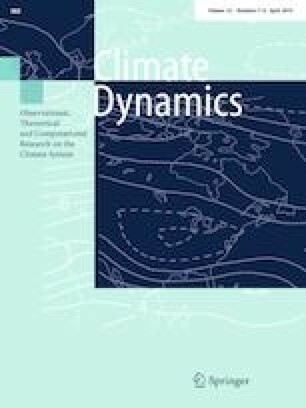 This study was supported by the BMBF’s project “RACE II” and by the InterDec project “The potential of seasonal-to-decadal-scale inter-regional linkages to advance climate predictions” of the JPI CLIM Belmont-Forum. The climate model integrations were performed at the Computer Centre at the Kiel University and at the High Performance Computing Centre (HRLN).